The controller features a full color touchscreen making navigation easy. 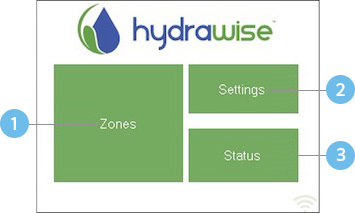 The Home screen, shown below, has 3 buttons allowing you to view and run your irrigation zones, change controller settings or view status information. Each screen (except for the home screen) has two buttons at the top of the page allow you to quickly navigate to the Home screen or the previous screen. All items on each screen are color coded to indicate which screen elements are buttons and which screen elements indicate status information. GREEN screen items indicate settings that can be changed. If you touch on the GREEN color item then you'll be able to change that setting. 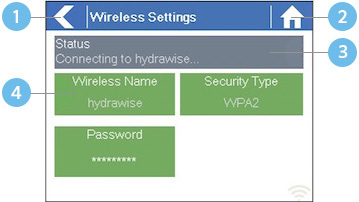 GREY colored items indicate status information. Touching on these has no effect. If you're entering information into the controller and use the Home or Back buttons then your changes on that screen will not be changed.